Something was lost in the transition to digital effects: chiefly the sense that something is in the room and you are afraid of it. It was in the closet, under the bed, in the water, around the corner and it had mass and dimensions and it could reach out and touch you. And even on VHS with bad tracking on a TV smaller than a microwave that meant something. It meant that monsters were real and you were free to get as giddily afraid of them as you wanted. Even movies as bad as Anaconda gave you the sense that a real monster was stalking the poor humans in front of us. When a generation of movie goers through something in the VCR, they knew they stood a good chance of seeing something that would inspire us to check under our beds before going to bed. Here are 10 Horror Movie Monsters That Scared You as Children. Philippe Mora’s The Beast Within is a pretty strange beast: a tale about a Lovecraftian legacy of horror invades what should be a gentle coming-of-age story. A boy is inhabited by an angry spirit that wants badly to turn into something worse. When we see his final transformation, it’s big, ugly and frightening. The movie has let us know that the creature is at least part locust but Mora never gives us a full enough glimpse of the creature to divine its dimensions. Just enough to send kids’ hands to their eyes. As the adage goes, less is definitely more when it comes to this icky movie monster. On its face, Razorback sounds ludicrous. A giant warthog terrorizes a little outback hamlet, killing every so often and then vanishing. Like Steven Spielberg before him, director Russell Mulcahy didn’t trust in the beast’s intrinsic scariness, so he supercharges his coverage of the animal, showing us just enough to convince us of its mammoth size and formidable viciousness. A giant warthog should be funny. Instead, it’s awe-inspiring and has given more than its fair share of nightmares. Unlike Spielberg, however, Mulcahy doesn't couch his narrative in sentimentality. This one is just frightening and it anchors one of the great forgotten 80s horror films. Bret McCormick’s killer tumor film The Abomination has the feeling of a home movie that the general public was never meant to see, which of course makes it even more fun. 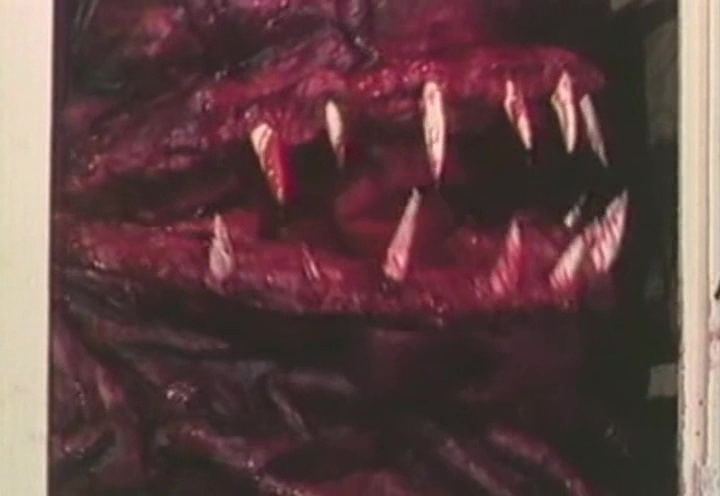 With the production values of the evangelical infomercials it lampoons, The Abomination pits a gooey homemade monster - it resembles a giant bloody mouth with tendrils that go bring prey closer - against a town full of rednecks who wronged an impressionable boy worried about his immortal soul. The crudeness of the Abomination itself actually makes it more off-putting and terrifying. “He’s hungry…feed him!” Once you’ve seen it waiting in the cupboards and the washing machine, it’s tough to imagine something unspeakable, weird and angry isn't waiting there… even now. Rob Bottin gave us many lovely practical effect beasties over the years and is singlehandedly responsible for more night terrors than almost any other make-up man. Though it’s tough to choose a favorite vehicle for his genius (The Thing, Legend), The Howling is a pretty nasty dose of Bottin’s magic. Eddie The Mangler, the chief villain in Joe Dante’s The Howling is a double threat: a serial killer and a werewolf. His transformation and first attack are some of the most grizzly moments ever committed to film. Bottin's make-up gives this monster a richly tactile reality. Try to imagine he isn’t hiding in your closet after watching. Though the original Blob from the 1958 Steve McQueen film is sort of creepy and charming, it wasn’t until the '80s remake that it really projected menace. A living mass of pink slime that melts the human body like wet cotton candy, it’s truly a dreadful creation. Tony Gardner’s special effects are wonderful, giving the blob drive, purpose and, above all, intelligence. Its ruthlessness is terrifying in its own right, nevermind what it does to even the children of the town it attacks. No one ever expected a blob could be so scary. The simultaneous release of Deepstar Six and Leviathan may be a classic case of one studio trying to beat another to the punch, but the results were, for once, equally entertaining. Neither was ever going to win an Oscar, but both feature awesomely grotesque and scary sea creatures that make them worth watching over and over again. In both films, underwater work stations in the not-too-distant future are beset by ancient creatures hellbent on eating everyone on board. In both films, the creatures are magnificently horrible. Hollywood could remake both and not use up the potential of pitting a few working stiffs against huge, angry sea demons in a claustrophobic space. A marvel of home-made ingenuity, Doug McKeown’s cult classic is the holy grail of the VHS era. Its monster, a pink fleshy extraterrestrial with three heads and innumerable teeth, attacks and kills defenseless humans for sport. The best part? Its features make it look happy to see you…just before it has you for lunch. Low budget horror doesn’t get more engrossingly gross or clever than this. The budget never shows once when the creature's on its killing spree. This thing looks like it could reach out and touch you. Say what you will about the (relatively) big budget alien from Alien, but this one freaks us out even more. Who hasn’t lost sleep over a scary clown before? From Clownhouse to Killer Klowns From Outer Space, there are no shortage of horrifying harlequins from which to pick. But we all know who the boss of unearthly joy really is. We've talked about how freaky clowns are on Screen Rant, but this might be the freakiest. Tim Curry’s Pennywise has given more kids nightmares than just about any other monster. He’s such a scarring, malevolent figure that when he assumes the form of a giant spider-legged creature, it hardly matters. Nothing is more frightening than a clown with sharp teeth. Nothing. 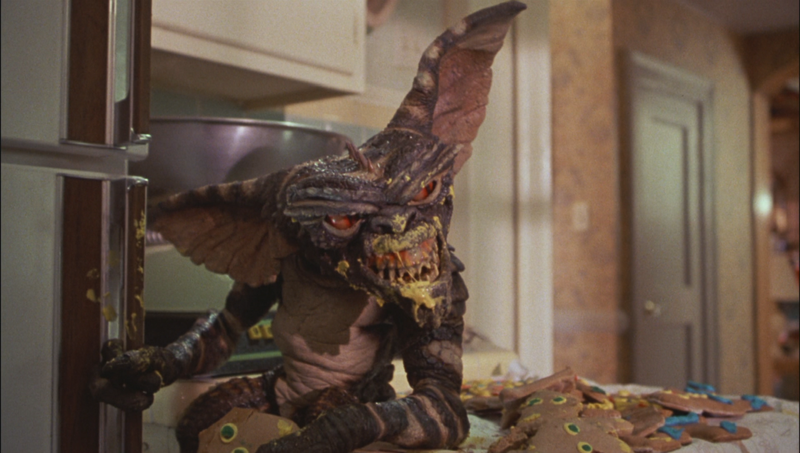 The greatest trick Joe Dante ever played was introducing the world to Gizmo, then replacing him with the sharp toothed little critter we all learned to recoil from. Just look up. That thing is frightening. How do you compromise that with the cute and cuddly little guy from the beginning of the movie? The little monsters that captured the imagination of kids everywhere, gremlins are unforgettable creatures. Endearingly nasty and foul-tempered, Dante invests them with Bugs Bunny’s sense of humor, murderous tendencies and a short fuse. They let every kid know that the toy they love, the cute one their parents gave them, it could turn against them at a moment’s notice. The Puppet Master films have become so insanely numerous that it’s tough to remember that at first they were just a genuinely creepy idea. Something home-made and crazy that would find its way into your most private space and try to kill you. Coming in many shapes with many different instruments of destruction, the puppets would be a little cute if they weren’t so prickly… or anyway, so deadly. Like Chucky from Child's Play and the Krusty the Clown doll that tries to kill homer, childhood toys can be among the most frightening objects in horror. Sure there have been many memorable CGI creatures. Gollum, the croc from the massively underrated Rogue, the new Godzilla. But there’s something special about knowing the monster is really right there. Which monsters scared you as a kid? Which still scare you? Do you prefer CGI to latex?